Bridges: those many ways of getting from here to there. They are structures carrying a pathway or roadway over depression, obstacle, or chasm. They define a time, place, or means of connection or transition. Sometimes bridges shake. Sometimes bridges burn. Or they may carry us safely over troubled water. Come join us to listen to true stories about bridges. Claudia Perchinelli is originally form Brooklyn, NY and came to Tucson to attend UofA and to see if people really have last names that don’t end in a vowel. She wanted to be an astronaut but settled for a civil engineer. She left Tucson after graduating college and lived in 10 different cities including, Boulder, San Francisco and Honolulu before returning 10 years later to open her own bridge design firm called Structural Grace. She is a bridge designer, rock climber, runner and Mom. She believes bridges are intrinsically beautiful and makes every effort to design beautiful structures. Some of her local work includes the Cushing St. Bridge and the Kino Parkway over 22nd St. Overpass. Dr. Grace Gamez is a mother, activist and scholar. Her research, coupled with her own personal experience in the system, provides her with intimate knowledge regarding the structure, operation, and intended consequences of the criminal punishment system; particularly, how it impacts women and families. She holds a PhD in Justice Studies from Arizona State University, a Master’s of Science in Mexican American Studies and Public Health form the University of Arizona. Her recent research explores the role of motherhood in relation to the long lasting effects imposed by criminal identity. Through testimonials of formerly incarcerated/convicted mothers, her work illustrates how law shapes social perceptions and existence by placing mothers with conviction histories outside of the boundaries of normality. Her community involvement includes being a founding member of the Arizona Ethnic Studies Network, which organized campus and community actions in defense of Arizona’s Ethnic Studies programs, including a Banned Book Reading at the State Capitol. Dr. Gamez is inspired and motivated by creative insurgence-principally, what people create in the absence of institutional liberty. Rhodes Scholar, Congressional Medal of Freedom recipient, Grand Chess Master, radio announcer and third place finisher in the New York City Marathon are but a few things Terry Ahearn has not achieved in his life. However, he has a wonderful wife Linda and is the proud father of Haley & Cole! An aspiring writer, story teller, humorist and most other things are still possible. A Wisconsin transplant by way of California and Green Bay Packer fan, Terry enjoys road trips and strives for the simple life with a less is better philosophy. His pleasure is making people laugh. Greg Hart has been involved in education in Arizona for forty years. He and his wife Vicki have been married for 45 years. They have two sons, Nathaniel and Abraham, and a granddaughter, Tallulah Jo. Greg was Director of Pima County Adult Education (PCAE) from 1982 until 2000. In 2000, PCAE merged with Pima Community College, and he then became Dean of what then became known as Pima College Adult Education. Hart has served on various community boards, including the YWCA and as President of the Community Food Bank. He is currently President and Executive Director of Edge High School, an alternative high school which he co-founded in 1995. Michigan born Dea Brasgalla, 82, first came to Phoenix, AZ , in 1953 during a summer vacation from Nursing School. Upon graduation, she moved to California in the LA area and lived there for 10 years. She even left nursing for 3 years to work as a Meter Maid for the City of Beverly Hills. She has worked as a R.N. with the Hopi, Pima and Papago tribes, as well as 17 years at the State of Connecticut Veterans Home and Hospital in Rocky Hill. After a back injury and attaining her BA in Psychology, she retired, returned to Arizona, and lived on the Hopi Reservation for 14 years before making her way to Tucson. She studied Hypnotherapy and is a CHT-NPL graduate. She completed her Seminary studies in Metaphysical Principles, and was ordained a Minister in December of 2014. She has also volunteered for Wingspan, TIHAN , and worked on several political campaigns. She is an advocated for social justice and this is her second attempt at storytelling, having volunteered for the Speaker's Bureau for Wingspan. Kamaran Zangana is Kurdish and has being living in US since 1994. He has two degrees, Social work and Philosophy from Eastern Michigan University. He is a published writer, having written three books in his native language. He has been living in Tucson since 2013. Jennifer Nowicki Clark is an educator, organizer, printmaker and mom. As co-director of the consulting firm, Creative Narrations, she trains different groups throughout the country to create multi-media digital stories in their communities and share them to spark dialogue and create change around issues that are important to them. She loves being a part of the Odyssey team and believes that there is no better tool than a story told from the heart to heal, inspire, teach and breakdown stereotypes. Originally from South Jersey and Philadelphia, Jen has degrees in Sociology and Linguistics and began her professional journey teaching ESL and Civics for Adult Education students here in Tucson. Venue: The Screening Room, 127 E. Congress Street, Tucson. Parking information found here, and a map identifying downtown parking areas here. storytellers to see where your favorite personal story will fit in. The Screening Room, 127 E. Congress, Tucson. Do You have a story? Contact us! Storytelling is a way to make connections with diverse and different people that you may not meet in your every day life. Because these stories are from our lives they may be amazing, messy, enlightening, disturbing, and entertaining . . . and more. Six invited storytellers have ten minutes to talk about a specific theme. 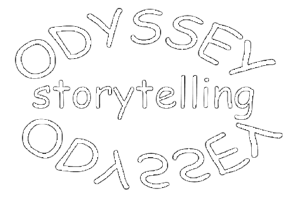 The stories are not read or memorized, they are told from the life experiences and creativity of the teller.